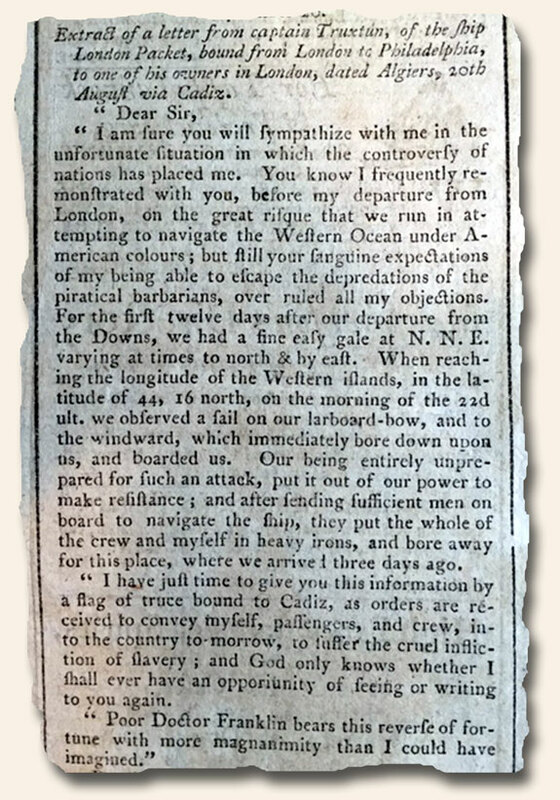 The Pennsylvania Packet issue of November 22, 1785 contains a curious report which puzzled me, for although admitting my knowledge of American history is far from where it should be, I do not recall reading of Ben Franklin being captured by Barbary pirates upon his return from France as Ambassador. Ben Franklin taken away in irons? Really?? I turned to our friend/long-term customer/naval expert George Emery for some explanation of this report. He relates that in Eugene Ferguson’s biography of Trustun, “Truxtun of the Constellation” (1956) he mentions this rumor while explaining Truxtun’s decision to arm the London Packet (to be renamed the Canton) for a forthcoming voyage to China. 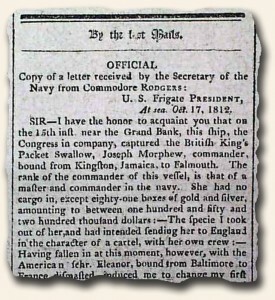 And the source of this rumor was this very newspaper: the Pa. Packet of Nov. 22, 1785. Apparently some enterprising reporter, “confusing ” Truxtun’s reasoning for arming the Canton to rewrite the “future” as a scary & perilous event of the past, all–perhaps–to sell more copies of the newspaper. 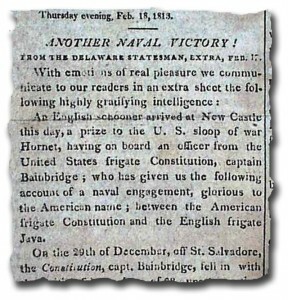 Or perhaps Truxtun himself was responsible for this letter’s presence in the Pennsylvania Packet to bolster support for arming American merchant vessels then sailing to Europe, and particularly the Mediterranean. Ferguson goes on to mention in his book: “…while he was yet bringing Franklin home during the last voyage, it was rumored in London that Captain Truxtun’s ship had been captured by the Barbary corsairs and that all aboard, including the great Franklin, were consigned to slavery in Algiers…”.